The Light in the Attic label has done an exemplary job in getting Lee Hazlewood's music back into the hands of the fans who watched it go out of print and rarely come back in the digital formats. 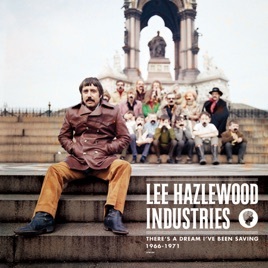 Seven years in the making, this expansive set documents the output of his label, Lee Hazlewood Industries. It includes everything Hazlewood recorded for the label and highlights from his roster of other artists, which included Gram Parsons and The Incredible String Band, Suzi Jane Hokom, Ann-Margret, Hamilton Streetcar, Arthur, and Lynn Castle among the ranks. For Hazlewood's own material, unreleased tracks join every single and b-side, plus the full albums Cowboy in Sweden, Forty, The Cowboy & the Lady, and Requiem for an Almost Lady. Such inspired productions as Sanford Clark’s “The Black Widow Spider,” The Shackelfords’ “California Sunshine Girl,” and Larry Marks’ “The Start” feature among the other artists on the label. The material is 95% transferred from the original analog master tapes, with the remaining 5% mastered from mint vinyl sources. It was a crazy, inspired time.